Now that I'm a bona fide family member, Matt's dad sends me a weekly dose of inspiration. Normally, I am not a fan of e-mail forwards, but the ones he sends me are actually really good (Editor's Note: I'm not just saying that to earn points with my in-laws...). This one about geese really resonated with me. I especially like the idea of flocking together with people who are headed in the same direction. Matt inspires me on a daily basis to live my best life (except when he suggests that we go to Amy's Ice Cream three times a week). Fact 2: When a goose falls out of formation, it suddenly feels the drag and resistance of flying alone. It quickly moves back into formation to take advantage of the lifting power of the bird in front of it. Lesson 2: If we have as much common sense as a goose, we stay in formation with those headed where we want to go. We are willing to accept their help and give our help to others. Lesson 3: It pays to take turns doing the hard tasks and sharing leadership. As with geese, people are interdependent on each others' skills, capabilities, and unique arrangements of gifts, talents, or resources. 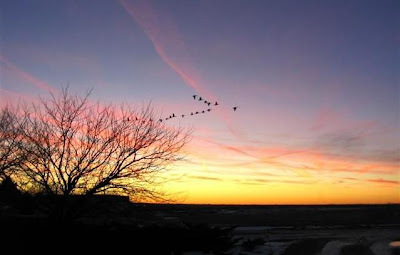 Fact 4: Geese flying in formation honk to encourage those up front to keep up their speed. Lesson 4: We need to make sure our honking is encouraging. In groups where there is encouragement, the production is much greater. The power of encouragement (to stand by one's heart or core values and encourage the heart and core of others) is the quality of honking we seek. Fact 5: When a goose gets sick or wounded, two geese drop out of formation and follow it down to help protect it. They stay with it until it dies or is able to fly again. Then, they launch out with another formation or catch up with the flock. Wow that's so awesome!! I love that. Beautiful post!! It's always good to be reminded of these lessons!! Thanks!